…a standalone component system in which players could embrace the darker side of an already grimdark franchise by assuming the role of Chaos-touched enemies of the Imperium. The character creation rules offer a decent array of human and space marine “archetypes” covering heretical tech priests, nomadic renegades, charismatic apostates, and brain-blasted warp- dabblers. The space marine options are significantly more powerful than the baseline human ones out of the gate, but the game tries to mitigate that by granting the latter a bit more versatility in terms of skills and talents, but hardly enough to offset playing a nigh-unkillable superhuman who can chew through steel bars and headshot a gnat at five hundred meters. A wise gamemaster would be better off basing a campaign around either marines or regular schmoes, but any conscientious gamemaster would probably steer clear of Black Crusade to begin with. Character advancement in Black Crusade is entirely open-ended. Any developmental advancement can be purchased as long as the player has the fairly modest prerequisites and experience points to burn. In a clever (but ultimately futile) attempt to impose some balance on this free-for-all, each skill, talent, and characteristic bonus is tied to one of the Warhammer pantheon’s quartet of chaos gods. Multiple purchases from the same domain will align the player with its associated divinity, reducing the cost of further advancements from their pool but increasing those from other gods. The split boils down to martial prowess and physical durability versus arcane power and guile, which would be a reasonable trade-off in a system with less of a focus on resolutions via combat. Unfortunately, Dark Heresy isn’t really that game. The thrust of Dark Heresy’s default campaign narrative centers around a small band of heretical malcontents working their way up Chaos food chain in order to ascend to daemonhood, lead a titular “Black Crusade” against the Imperium of Man or both. Because there’s no “we” in “genocidal warlord,” backstabbing and hidden agendas among the PCs are expected and encouraged. The metrics of players’ long-term success are tracked by two scores known only to the gamemaster, corruption and infamy. Corruption represents how deeply the taint of Chaos has ensnared the player character, eventually manifesting as physical “malignancies” and mutations. Infamy is essentially a reworking of Rogue Trader’s “profit factor” — a fluctuating tally of a character’s resources and reknown which also doubles as Black Crusade‘s answer to the previous systems’ mulligan-granting “fate points.” The ultimate goal is to hit maximum Infamy (and gaining control of galaxy-shattering power) before hitting maximum Corruption (and being reduced to a amorphous glob of screaming protoplasm). These mechanics put a (mostly) fixed duration on Black Crusade campaigns. There is a specific endgoal — and punishment for failing to meet it — above and beyond those held by the individual PCs. It puts the game in a weird place between the one-off fatality funfests of Call Of Cthulhu and Paranoia and the evolving epics of longform ongoing campaigns. The approach is interesting though I can’t personally ever imagine myself running or playing Black Crusade for real. I’ve never been particularly jazzed about “evil” campaigns, either on the tabletop or in choice-heavy computer role-playing games. Playing a heel, even as make-believe, just makes me feel kind of gross. (Why, yes, I am a guy who prefers Captain America and Superman to the Punisher and Batman. What made you ask?) Too may of my experiences as a gamemaster involved having to rein in a bunch of desperate-to-impress adolescents’ worst impulses. The thought of indulging — or, worse, encouraging a group of players — to indulge in a carnival of fictional atrocities for “fun’s sake” is anathema to me. 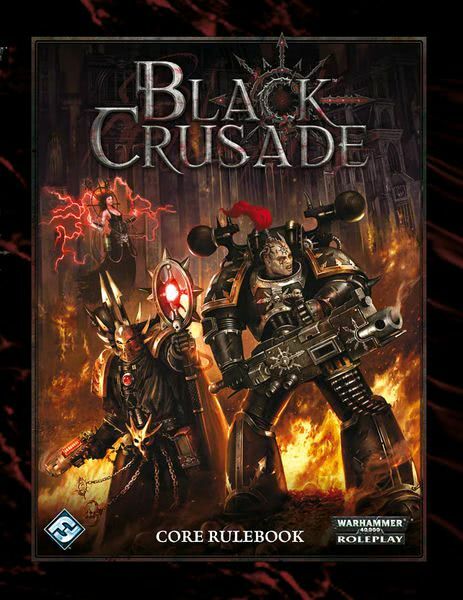 As a working game, Black Crusade was decidedly not-for-me. Yet I still purchased the core rulebook, because I was curious, had gotten into the habit of picking up every new 40k RPG sourcebook, and because the fluff bits make for great bathroom reading.